10 THINGS TO DO NOW FOR FALL! Are you reading this at the pool, or beach or on vacation? I know you might think it is too early to decorate for fall. But not really! At least, it is not too early to begin thinking about fall decor! 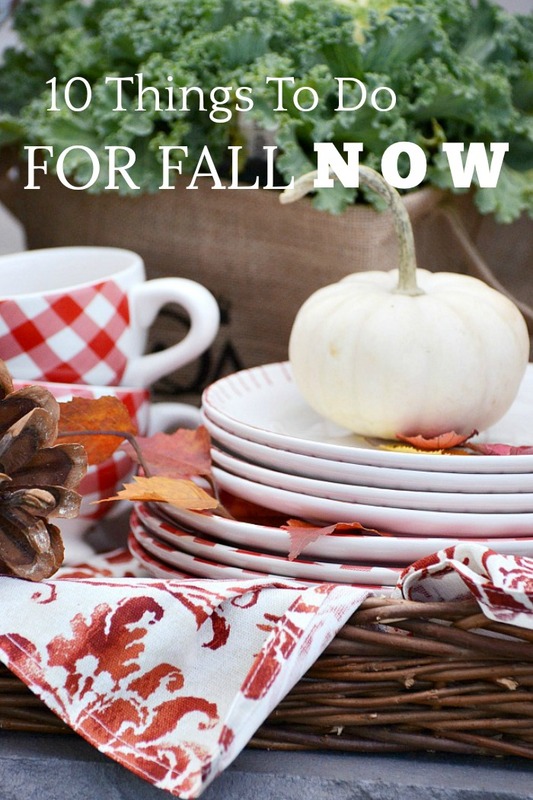 Today, I have 10 things that you can start to do right NOW to be ready for fall! These will get you in the mood for the upcoming sweater weather! Today on Decorating Tips And Tricks we are talking about FRESH WAYS TO DECORATE A HUTCH! If you have a hutch, open shelves or any horizontal surface you will want to listen in. We have lots of great tips for you! Here are 10 things to do for fall NOW! One of the very first things I do to decorate for fall is to make a big wreath using elements of the season! 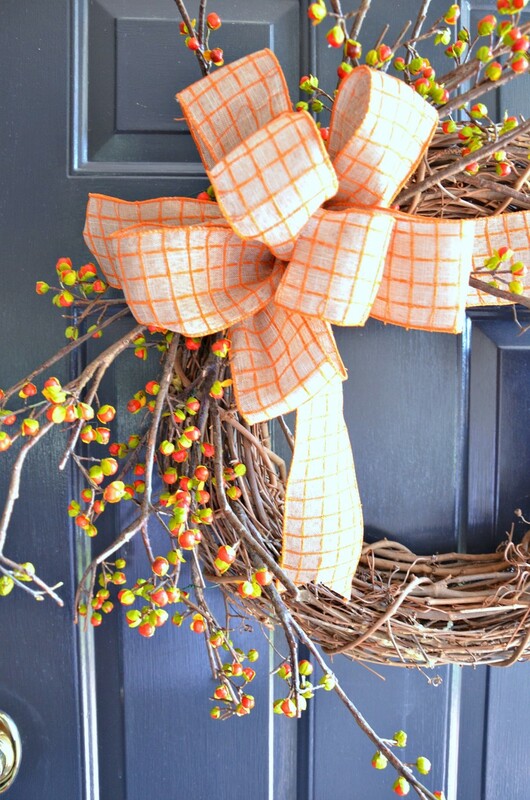 Welcome fall and everyone who comes to your front door with an autumnal wreath! 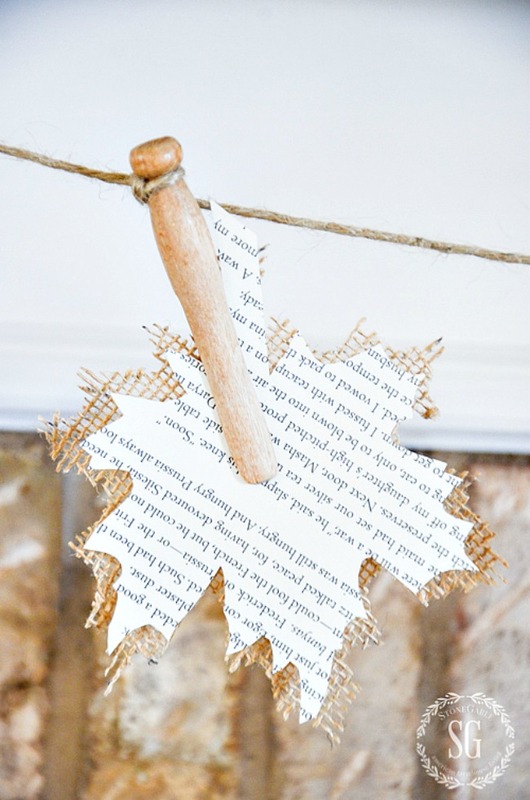 Make it now and it will be ready when you are to decorate! 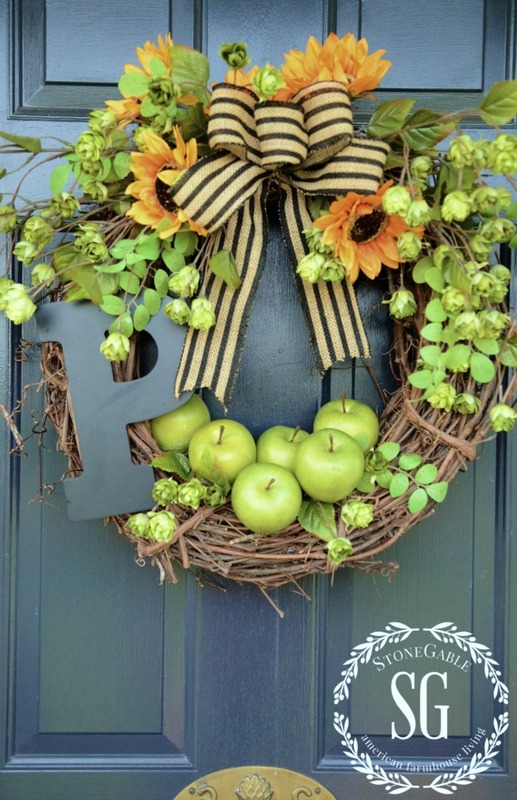 You can see my EARLY FALL GREEN APPLE WREATH DIY. It is really a very easy wreath to make. Wouldn’t this look so pretty on your front door? Or if you prefer a more brambly wreath why not make this BITTERSWEET WREATH? 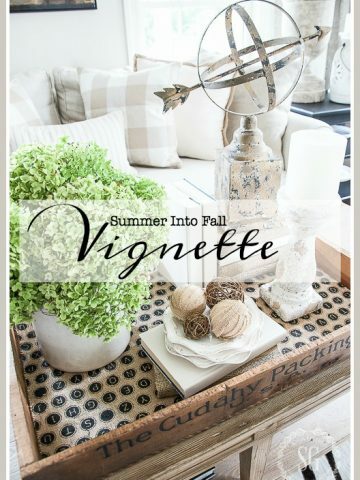 Now is the time to create a vignette that will transition from summer to fall. Choose things to go in your vignette that will work for both seasons. 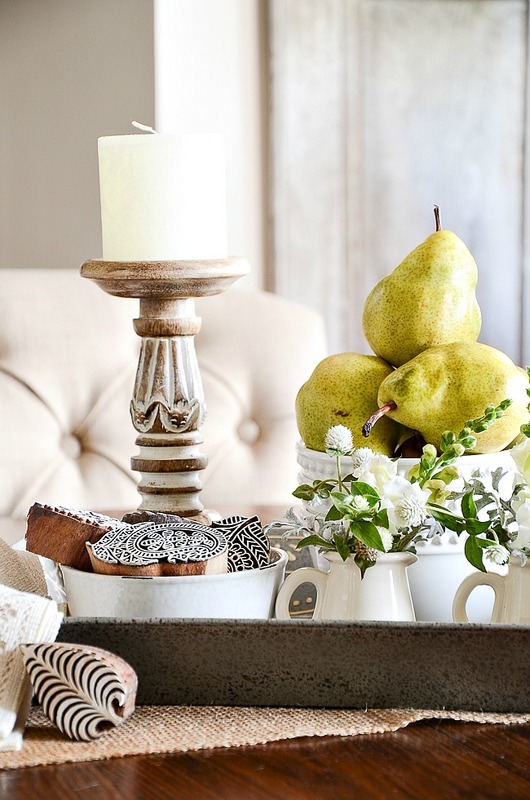 Pears are a great natural element that work wonderfully this time of year! I have lots of FALL vignette inspiration for you HERE and HERE and HERE. 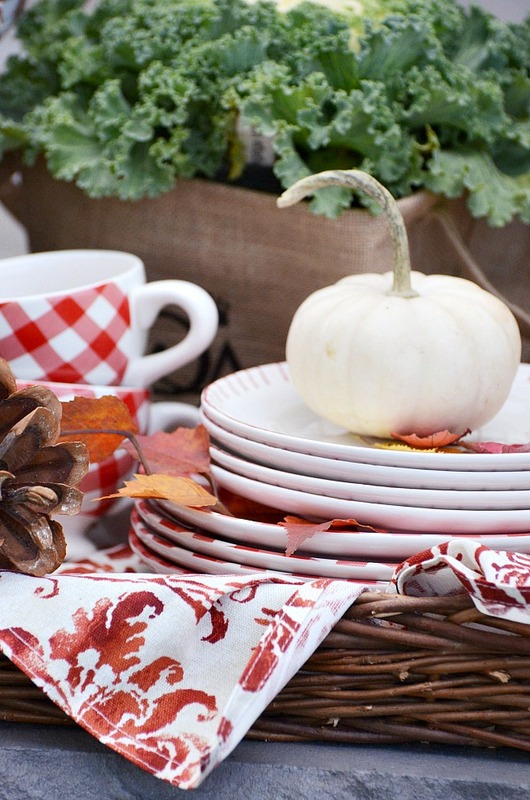 This year get out your beautiful dishes and other fall accents. Don’t let them sit in plastic bins or cupboards! Get them out now so you can use them all fall long. Use them on the table and as part of your decor! Stack them, layer them and use them as a perch for great fall accents! This is the year to show them off! GET YOUR FALL TEXTILES READY! 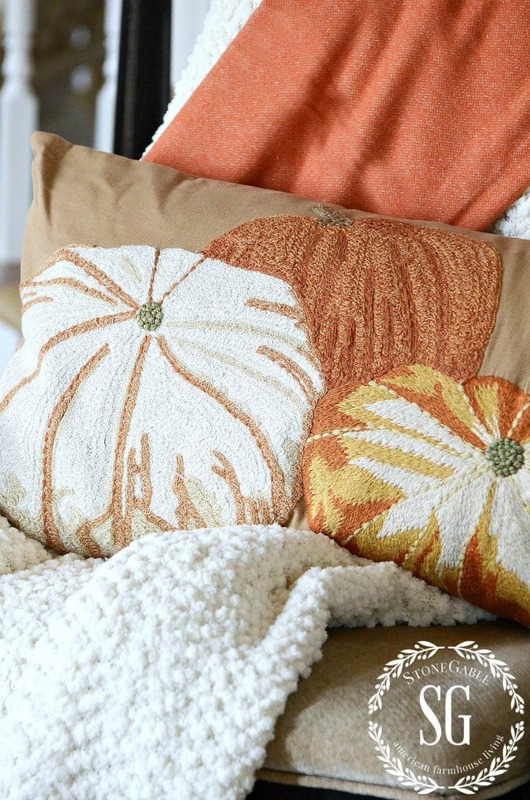 Do you have fall pillows or throws? How about a cozy fall tartan or bedspread or duvet? I bet you have napkins that would look gorgeous for fall. How about a table runner or tablecloth? Right now is the time to get them out and launder them. Make sure they are in tip top shape for fall! Don’t forget to dry clean your pillows every now and then! They get soiled and dusty too! It’s also time to PURGE outdated, tired and worn textiles you won’t be using this fall. Don’t hold on to them… let them go! You will feel so so good! Also, how about looking for one or two new things. Look for early sales and things you just can’t live without. Better yet, let’s make something new!!!! The cute fall pillow below was made from a placemat. You can find the tutorial HERE. 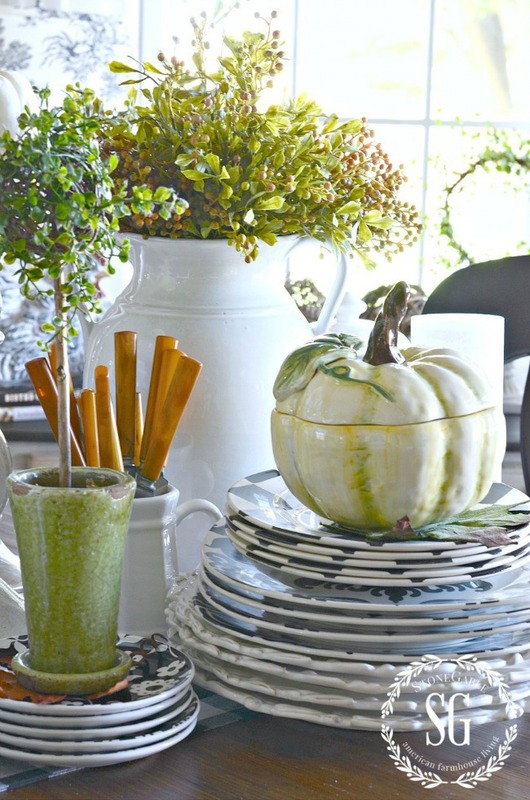 GO THROUGH YOUR FALL DECOR AND PURGE! Just like purging our old fall textiles that are no longer usable, we should go through all of our fall decorations and do the same. So when you are ready to use your fall decor you will know what you have, what you need and WHERE EVERYTHING IS! Just think how much easier it will be to have all your fall decorations organized! Start now and purge and organize a little bit each week until fall. It will be here before you know it! One of the best investments I have ever made was my dough bowl. It’s not old and it is probably not hand carved but it still looks great and is perfect for fall decorating! You can see how to style a fall dough bowl HERE and HERE. There are so many ways to use it. A vignette, a fruit bowl, a planter, a magazine rack… just to name a couple! Below I made green apples into little candle holders and put them in a small dough bowl. 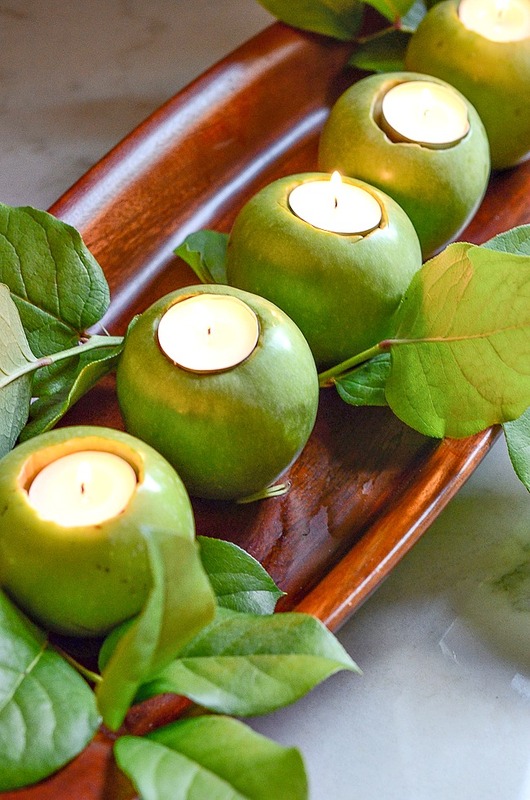 You can see how to make these sweet apple candle holders HERE. Big or small dough bowls are a fabulous fall element! Oh, this is so much fun! Create a fall inspired garland. You will be able to use it over and over! I can’t wait to get out my BURLAP AND BOOK PAGE GARLAND. It makes a big, fun fall statement! Even if you are not crafty, you can make this. All you have to do is trace and cut! Easy- peasy!!!! And I have step-by-step directions for you … and leaf templates too! You can find lots of fall garlands and banners on Pinterest! purge… be ruthless. NO CHACHKIES! make a list of what I need… yes, another list! Guess what? I just made my early fall list!!!! There’s lots more, but I’ll add to the list as I think of things to do! It’s so important to have a list that is reasonable and doable and real! And it feels so good to be able to check off each fall task! 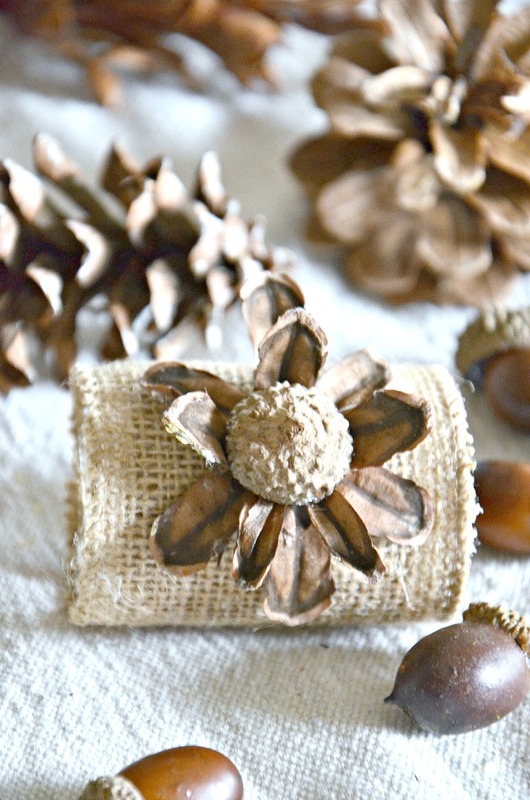 Burlap was made for fall decor! It’s warm and nubby and comes in different warm colors! Why not make a burlap table runner with pretty fringe? Or a No Sew Burlap Leaf Wreath? How pretty would this look on your sofa? OKAY, #10 IS YOUR TURN!!!! Please leave a comment with what you think you should do NOW for fall! I can’t wait to read them!!!!! You might like to follow me on Pinterest. I have over 1,400 Awesome Autumn and Fabulous Fall pins! You can follow me here and see all the great things I am finding to pin every day HERE! Beautiful ideas! Inspiring and yet something I feel I could do with things I have accumulated over many years but have tucked away. I’m excited to get busy with my Christmas decorating. Thanks for the inspiration! Can you please tell us where you purchase any of your decorating items? You do such an awesome job with all your decorating ideas, but I have no idea where I could go to buy some of them. Thanks for all your inspirational décor ideas! Thanks, Yvonne. Beautiful, inspirational post! I cling to summer as long as possible and gently transition to fall. Your beautiful ideas will help. Finally found just the right soft orange throw to go with the sofa and pillows. I plan to embrace hygge and to start using more candles as the days get shorter. I’ve just bought a new house and will be in August 26th. I can’t wait to unpack, dust off, clean and get ready for fall. I am so excited. I have a new front porch and will be buying two rockers which of course need a new throw and pillows. I can’t wait to purchase some pansies for my garden and mums to go with the porch. Congratulations on your new home Brenda. May you enjoy many blessed years there! Love the two wreaths! Each wreath is so classic, the look great! I can’t wait until Fall. It is my favorite season. Thanks for all the great ideas, Yvonne. I love all of your fall ideas. I inherited my mother-in-laws chintz dishes. Each fall I set the dining room table with these dishes which have more ‘fall’ type coloring with a cream background. They look wonderful and are a sweet reminder of the many family meals we shared with my in-laws using these dishes. I love how you take the simple things and turn them into spectacular. Love the blogs and great decorating tips. I can always spot your style when I’m on Pintrest. You’re great. What a motivating post!! I’m heading to my attic to start fishing around as soon as I’m done with this comment. Something I do to prepare for fall, or any season for that matter, is I change the 4×6 family pictures to pictures appropriate for the season. Occasionally I will update one but since I keep several pictures in a frame at a time, I usually just pull the fall one from last year to the front and voila. My kids are in their 20s now, and I still have pics from when they were little and it warms my heart to see them each year. Whole house takes 10 minutes and it immediately makes it feel “fally” around here. Get out your picnic basket and put together your tailgating package. Buy some fall inspired “paperware”, napkins, plates, plaid tablecloth, etc. Team themed colors or fall inspired..dosen’t matter. Be ready for those picnics during leaf peeping season, or when you headed out to root your team on! I love all of these ideas, especially the purging old decor part, something I really need to do after thirty odd years of home keeping! I have been drying flowers from my garden. I grew strawflowers specifically for this, and of course tending the pumpkins that are still growing. Also, an idea that has just occurred this past week, I’ve been collecting sticks and stalks that have interesting shapes and textures, will possibly spritz with black spray paint to create a spooky scene for trick or treaters. Now is the time to hit the fabric stores for cool fall burlap patterns. Also, burlap ribbon. There are so many ways to use it. I’m looking forward to getting out my velvet pumpkins. I have a big dough bowl that I will fill with pine cones, then real gourds and pumpkins, and the velvet pumpkins all over the top. I will add velvet acorns, maybe some nuts (in the shell) and beautiful fake fall leaves. Thank you for the list of things to do for fall. I bought a little burlap in different shades and I am going to try making the pillow with the fall leaves. I love your beautiful ideas. Wonderful list! Thanks for the inspiration. Yvonne, Where did you get those wood pieces in the “transitional vignette” photo? I love them! So many lovely ideas here! Yvonne, you are such an inspiration! With everything going on here in Houston, it is really hard to think about anything but the devastation. We were lucky and suffered no damage or flooding, but seeing what people are dealing with is so disheartening. I believe we must pick up and move forward and not let these happenings get us down. Your words and decor brighten my day and encourage me. Thank you and God Bless! I love reading all the fall blogs (absolutely love anything pumpkins)….after living in my coastal cottage for 16 years, I moved a candle stand with copper leaves from on top of my linen closet in master bath (where it displayed with antique aqua bottles)to the top of our TV cabinet andput it next to a beautiful blue and white Chinese tub (not sure what else to call it but I have used it to chill wines with ice in it). I am gong to fill the tub with little pumpkins and copper pine cones that spill over onto the top of the TV amoire. Your blue and white & orange inspired me. Thanks for sharing the great autumn decorating ideas!!! Great ideas – love autumn decor!!! These are some really great ideas! I’m itching to decorate for Fall now! 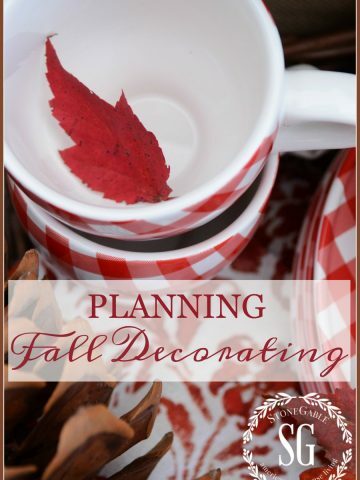 Great get ready for fall decorating tips. Thanks for sharing your great ideas. Ahhh, Autumn is truly my favorite season. I’m wondering if we will have a tinge of early cool weather as I’ve caught a peek of the slightest yellowy outline on some tree’s leaves? I’ll be thinking of what to do in my front porch planters, trying new recipes of soups, bread, and seasonal dishes, creating fall fragrances of all spice and cloves, early Christmas gift list ideas, shopping and crafting, deep cleaning, washing of comforters, yard trimming, the list could go on! We probably wont get it all done, but it ‘ll be on the list! An inspiring post for me. After my husband passed away this year I never even got summer out and was beginning to wonder if fall would show up – thanks to this post I believe I can make a list and actually make the change. I also plan to do the merciless purge – my attic is filled with ‘stuff’ (worn or broken) that I will never put out again, so it’s going. You always seem to be able to get my appetite whetted for change, large or small. My condolences, change may be just what you need now. Prayers for you. just thinking…can’t wait for pumpkin spice everything! You are so ambitious and have many good ideas! Love your photography as well! Here in Wisc. , I don’t want to think about Fall yet, summer is far too short anyway! But, I love your ideas and will put them to good use soon. I especially hope to decorate with burlap this Fall. I am painting a shelf Aleutian blue and will line the back of it with a burlap that has blue flower designs running through it. I plan to display my white ironstone pitchers on the shelf. I received my box of pre-ordered new fall goodies yesterday, and I am giddy with excitement! While I put some of the pillow covers aside (not quite ready to change those up quite yet), I used my lambs ear stems and my new 12″ black monogram letter “P” on my cotton wreath on my front door. Slowly but surely, I’m pulling things and putting them away, and prepping for my new stuff to make it’s debut.?? Way to early to think about the Fall season..it is one of my favorite seasons though. I know as a blogger u have to talk about…but I am enjoying the heat for now…? Summer always seems to go by so quickly, and this one is no exception. I love your idea of transitioning into fall with decor. It makes me mourn summer less, and look forward to fall with it’s warm colors and crisp air! This year fall is stressing me out.. I moved to Arizona.. Its 105 today…. Fall to me really start until late October here.. but I want to decorate much earlier than that…. Fall to me is cooler mornings and evenings, colors changing, its getting darker earlier… I have none of that here….. I love your vignettes. I am going to make your bittersweet wreath and apple candle holders. Obsessed with the white pumpkins! Gather up all those delish, fall apple recipes Cinnamon, cloves, nutmeg–those smells shout fall! Stencil a fall table runner, and trim your magnolia tree and put branches in a preservative to prepare for your fall wreaths. We rarely have a Fall season in So Cal. So when its 90 degrees in Oct. seems silly to put out fall decor. I do it tho hoping for cooler weather which rarely comes till closer to Christmas! Enjoy your ideas! Living in Florida now,I still decorate for fall even though the temperature says summer. I suggest tearing out dead annuals from outdoor pots (which I just did, Minnesota summer fried my calibrachos) and replace with fall annuals. Our local greenhouses still have a huge selection of asters and zinnias. Yes, I have to do that too! And get some green tomatoes for fried green tomatoes! YUM! Hi Y! What great ideas! I like the idea of going thru your fall decor early & doing an evaluation to see what you have & what you need. This is a great time to do this since the merchants have their fall decor & supplies out in the stores. If we wait until fall the selections dwindle & the choices aren’t as good. And I love having things done ahead of time ( while alot of people all still out shopping). One year I decorated for Fall on Sept 1st and then felt like Fall was a year long. I suggest planning now, but holding off decorating until it’s actually Fall – Sept 21. I like to remind myself it’s still summer during the first weeks of September even tho school is back in session. I want to enjoy summer as long as possible. In the midwest, it is time to think f fall. The days are getting shorter and cooler evenings. I can’t wait for the pumpkins to come out in the stores and am thinking of some burlap projects, especially the leaf pillow. It is a wonderful time of the year. We’ve lived in Florida for 30 years now. We know it will still be hot for several months. Come late August or early September I get the urge to bring out my fall decorations no matter what the temperature. I usually change the wreath on my front door first and gradually add the other decorations. By October it’s full blown autumn at our house no matter what the temperature may be outside. Every year I still get a thrill when I begin to see the autumn things appear in the stores even though we live in a warm climate. I’ve been scouring my favorite stores on the internet looking for a few new things I’d like to add to my Fall collection. I might try to make a seasonal garland…I really like yours and I don’t have any garland besides Christmas. Hmmm I do believe I’m going to have to do something. I’ve not been myself. I was looking for photos for someone and noticed how pretty my hutch was decorated in years past. I like the idea of decorating my hutch. But I think it is time to tear out my drooping flowers from window boxes. Tear out the stays green all year pots that line my entry sidewalk and start fresh. Everything seems weary. It’s been so hot for so long. We are still in the 100’s. And in our part of the country, our fall leaves don’t shed their color until Christmas time so we can’t wait on weather!! My to do list? A simple wreath for the door. Get out fall dishes and decor for my large open shelving hutch. Also take out old window box soil and plants to replant for fall and winter. Spruce up all the pots by the front door. We begin getting mums the end of August so it is time to accent with a few of them too!! Thank you for your reminders. Changing and purging pillows was a good reminder! !Thank you!! Thank you for the placemat pillow cover idea. That may be on my list for fall. Love all your pretty dishes! Fall is just a continuation of hot summer here in SoCal, so Fall decor inside my home is doubly important to celebrate the season since the outdoors will NOT look like Fall. I have been using various sizes and colors of ceramic pumpkins for years… lovely ones from Hallmark… but I’m ready for a change from “same ole” towards ones made from all sorts of materials and in more neutral tones to add more texture and interest. This is a great post, Yvonne, with lots of ideas! It’s still too hot in northern California to even be thinking about fall–I leave my patriotic summer stuff (i.e. for Memorial Day, Flag Day and July 4th, up through Labor Day when I start thinking about fall. Then up go the fall leaf wreaths along with some fall flowers and flags. The plain pumpkins come out then, but I hold off on jack-o’-lanterns until after October 1st. Once Halloween if over, I leave out the fall/harvest decor, take down the ghosts and other strictly Halloween decorations, and get out the turkeys and cornucopia. Wonderful ideas, from the readers, as well. I’m thinking I need to make a wreath for my front door. Love yours! Joann’s has some really cute faux pumpkins, but they are dark colors. I want white. So my search continues. I love your hutch too. I have one that my children kindly painted with white chalk paint as a Mother’s Day gift. I have wanted this for years. So thankful to have it now. Oh and I REALLY need to find my fall decorations now. We moved in Feb 2017 so I don’t know where the fall things are. Time to head out to the garage and search! Thanks so much for the tips and inspiration. I always look forward to reading your blog. 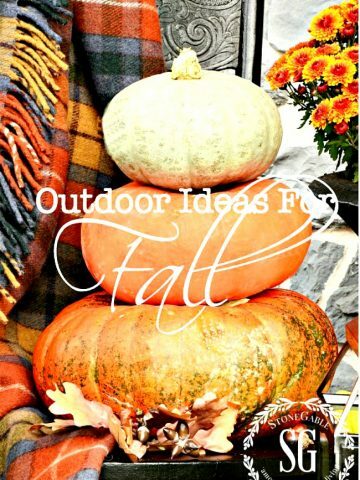 Love these ideas for fall! I need to make another wreath for my front door. Thanks for the ideas! I am in charge of seasonal decorations for our church, so I am always looking for new ideas. I welcome those from this fun blog and can alter some for a church setting. BIG on my list for this “fall” is a trip to Pennsylvania’s Amish countryside. I cannot wait to see the beautiful autumn colors!!! I love this post. Fall is my favorite season – except for Christmas – and since I usually purge my decorations at the end of the season, my fall box is ready to go. I have a beautiful elm bowl a friend’s father made for me from an elm tree that fell during a storm. Apples and pumpkins look great in this bowl. My colours are reds and golds taken from my great grandmother’s china that came from soap boxes. It’s cream with two shades of rust and brown and looks great on a red tablecloth. Lots of great fun and will start taking things out a week after Labour Day. I love the change of seasons and while I’m not rushing Summer, I am looking forward to fall. I have my planning list and have started to gather a few things. Getting the pine cones cleaned for my dough bowl and doing a little transitioning now with sunflowers. The weekend after Labor Day everything goes “fall” at our house. Thanks for your tips. Everything is so accelerated! Christmas items are in the stores in June. As much as I love fall, I’m going to enjoy what’s left of the summer. Of course! But we like to stay a little bit ahead so you have inspiration for when YOU are ready! Hi Yvonne, Thanks for the great ideas. 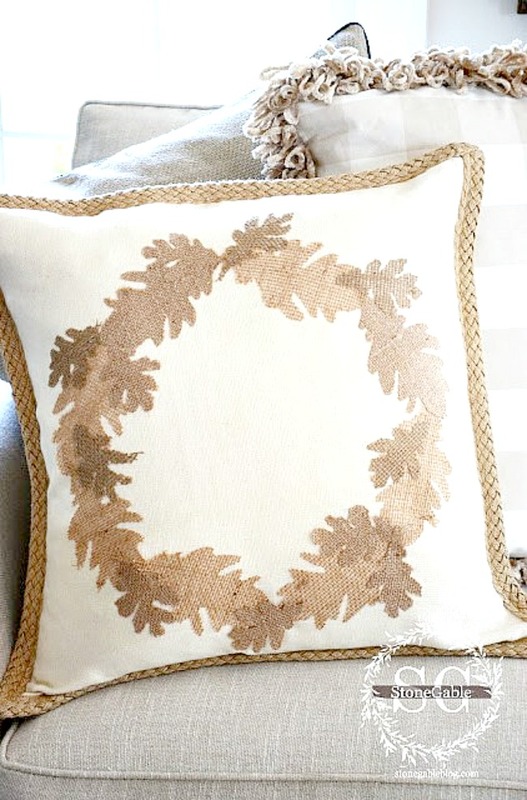 I love that No-Sew Burlap Leaf pillow! Right now, we’re trying to make the most of those last few weeks before our community pool closes. Blessings! All great ideas. I love your tartan throw. Here in Wisconsin you can just tell that the summer days are numbered. As much as I love Fall it still makes me a little sad because that means winter is coming and our winters are so LONG! Thanks for the pre-thought and inspiration! I am a red, red person so I enjoy the white pumpkins. They really do last a long time. I also will be savoring some lovely wine bottles and items to add to them for vinegars, I e green olives, herbs, and fresh cranberries when available. Just add white vinegar, a cook, and a bow. These jars are lovely on a window any window sill but really, really nice with the sunshine shining thru them. Some use the vinegar, I do NOT. Even when gifted, I say on the tag for display only. These will last from year to year, just a little different from what everyone shares. One of my greatest fall things to do as a parent, grand, and NOW a great grand (that’s me) is to take the children to a pumpkin patch for pictures! Come home and make a little photo album for each of the children. OH, when they are young, they enjoy this time. It seems crazy that fall is upon us, but here in Colorado it’s cool and rainy this week. I love having snuggly throws around and have ALWAYS loved bittersweet. I used to pick it in the country in Kentucky. Thanks for the tips. Fall is by far my favorite season! We have a huge pumpkin patch and I’m watching all of the pumpkins grow. We have giant ones down to baby boos. Looks like a bumper crop this year! I love your porch decor! What a wonderful list of ideas! I especially like your bittersweet wreath. I think I’m drawn to the beautiful simplicity of it. 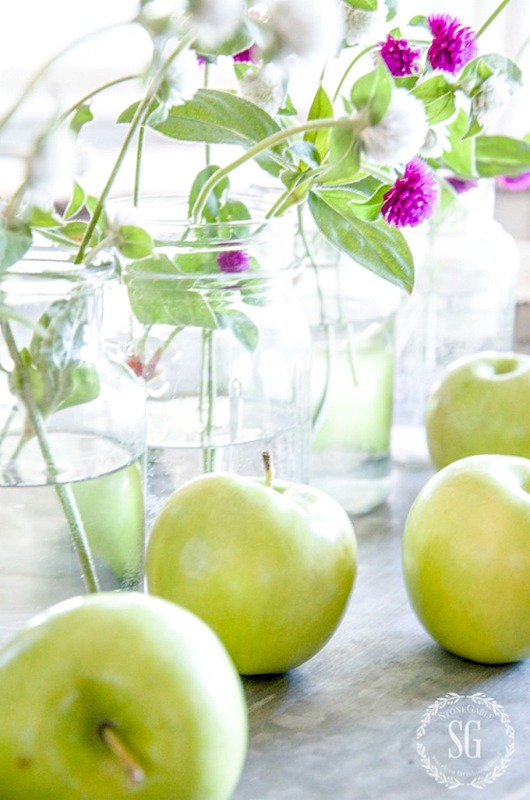 Similarly, I especially like the green apple centerpiece with its natural, organic beauty. I’m definitely going to give these a try! I am in seize the summer mode and doing all the things I don’t want to say I didn’ have toime to do this summer. To ready for fall, I am on the look out for some fall bloomers for my perrenial and cutting gardens and trying to keep the deer and grondhog from eating my pumkin vines! It’s going to be so HOT here in the deep south this next week, so just even thinking of Fall and doing some early planning makes me happy! I love my tartan throws, I have the same one you do. It took me a long time to find it, but I did! It was made in Scotland, so I know it is authentic, and is one of my favorite pieces. My front porch needs cleaning badly, everything washed down, but it’s so hot right now I may need to put that off for a couple of weeks. Then I will start preparing for my early Fall decor. Love your ideas, and tips, as always! I need to put porch washing on my fall list! 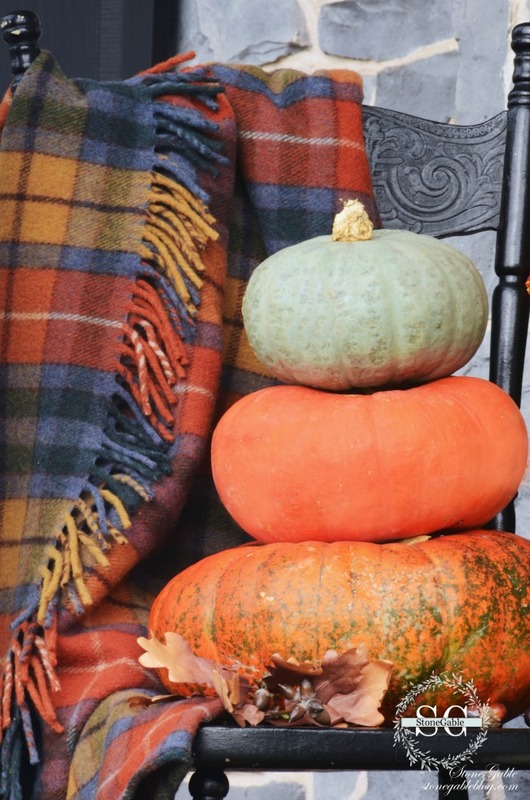 Love the pumpkins, love the pillows and love the pretty green apples. Love it all ! I am just in the “thinking” stage. I love fall, cooler temps, sweaters, fire pits, cocoa, pumpkins, sunflowers, falling leaves and just feeling cozy. You got me inspired to get busy. Thanks, Yvonne, enjoy your day! I have already started my fall list! Got pumpkins and pillows already to go! working on porch stuff now! thanks Yvvonne! Great list! 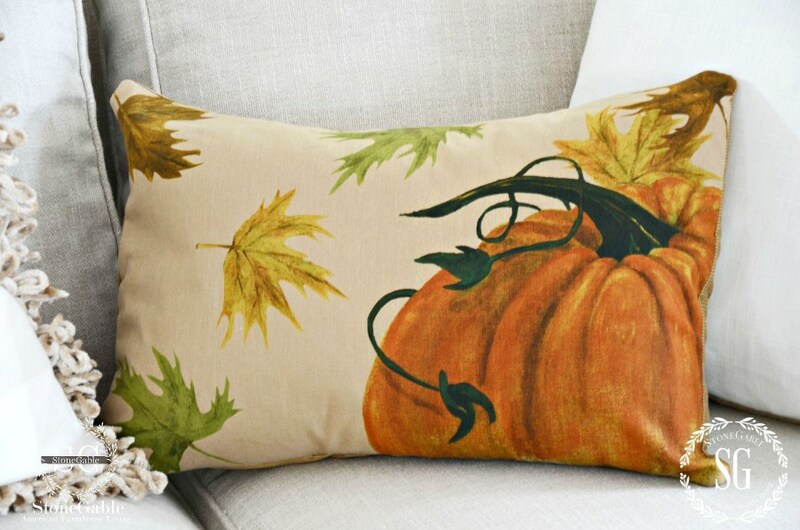 I just ordered a few new fall pillow covers. Can’t wait to share them in late August! I’m excited!! I have already started thinking of fall and doing some of those transitional things that you have mentioned earlier. I love fall and enjoy having the colors of fall around my home! Thank you for your helpful suggestions! 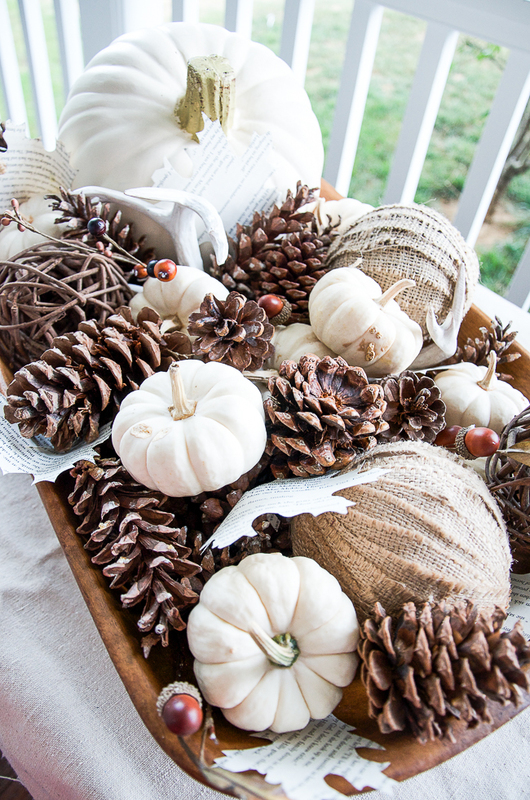 I love looking at your fall decor….fall here in Florida is slow in coming. 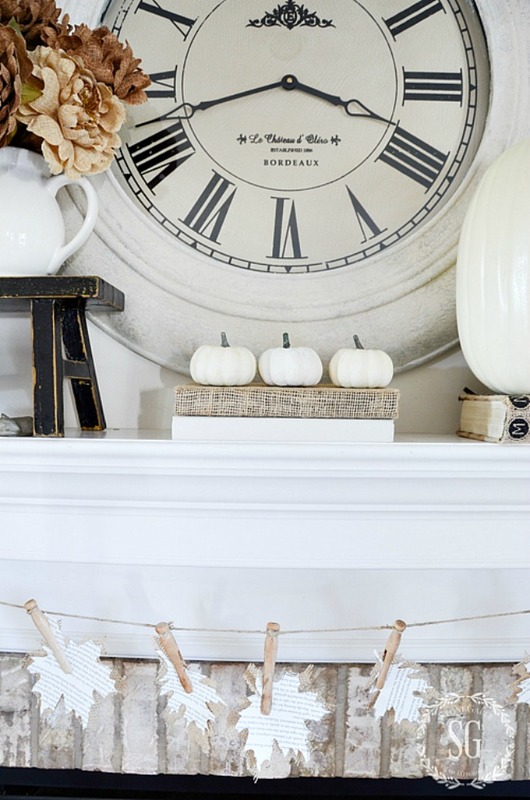 I am loving all the white and neutral colors that you make work for fall … white pumpkins, burlap, etc. You’ve given me lots of ideas! As always! I love neutrals. But this year I might be going a bit brighter! Where did you get your dough bowl from? What size is it? I reprogram my battery operated candles to come on earlier as well. I have them everywhere. Kind of obsessed with them in lanterns! I have a lovely old dough bowl from my grandmother that I re-decorate each season! Love it! Such sentimental memories too. What a wonderful treasure Deborah! Lovely ideas! I love the apple wreath! My favorite season! Great post! I will be picking my hydrangeas so that I can start to dry them and use them all over the house for the next year or so. This is usually how I start to get ready for fall. I also make a list of home projects I’d like to see completed before the cold weather sets in. Painting my main floor rooms is high on that list this year. I want it done before that Christmas tree is put up! Love your blog, Yvonne! Oh my goodness, Mary Jo! This is such a great tip! Great ideas – can’t wait for fall! Thanksgiving with only minor changes…sunflowers, apples, pumpkins, and, finally, my treasure trove of turkeys. You are a smart one! Great plan, Karen! August for me is my pre fall, sunflowers , pears, apples , moss a lot of the golden hues from the sunflowers. I have been preparing for a month, I get a little excited. I’m in the “jus beginning to think about it” phase. My list: linens, candles, wreath. UNshelled nuts.